Can you tell one special fact about the Sweetgum tree in front of the Westover Library? Why is the Kentucky Coffeetree at Chestnut Hills Park called that? What’s the difference between a Scarlet Oak and a Pin Oak? Now, it’s a breeze to learn about these trees because they have identification labels at their base. Each label provides both the scientific Latin and the common name along with some important details. The intended message is that all trees are not alike and there are recognizable details that distinguish one from another. When you know the identity of a tree, you can also learn where it is best planted, and what practical uses it has. We hope these plaques will stimulate interest in trees and, if well received, we will expand to other locations. The general locations for these plaques were based upon the accessibility and popularity of these sites for the public. Westover – Reed School has all four plaza trees identified. The Westover signs identify the four relatively young trees in the plaza of the Library and Reed School. Check out these trees when you visit the library or during the Sunday Farmers Market, and stop by the TreeStewards information table on the third Sunday of each month. Learn what’s unique about the Red Maple, Dawn Redwood, Burr Oak and Sweetgum. The Chestnut Hills’ signs are scattered throughout the more visible areas of the Park, focusing on native varieties (species) of Oak trees, five for now with two more planned when playground construction ends. Can you find all these trees and notice their differences? 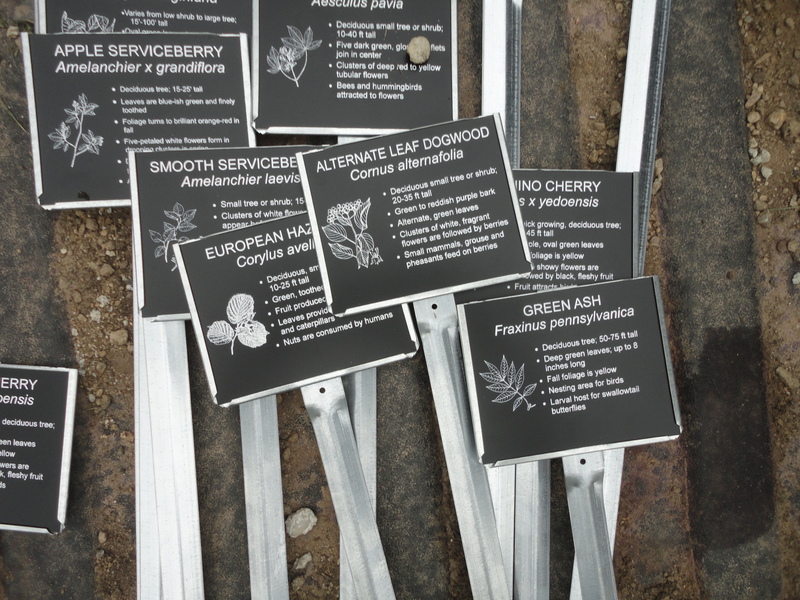 Read the plaques for specific keys to identification and uses of these trees. There is another native Oak species at Chestnut Hills, in a less visible location. Can you find and identify these trees? If you’d like a hint or walk with a TreeSteward, or wish to brag you found all 10 labeled trees, you can reach us through the comments page of this website. Can you find the Scarlet Oak at Chestnut Hill Park? Worth noting: the Scarlet Oak at Chesnut Hills is the Co-Champion (largest) of its species in Arlington County, and the Kentucky Coffeetree is the second largest of its species. There is also a Tulip Tree in the Park over 15 feet in circumference. What great Parks we have in Arlington! Finding the Pin Oak takes some searching, but it’s worth it. The labels were installed by Trees Stewards John Wingard and Don Walsh, with the necessary and able assistance of Parks employee Marco-Antonio Paredes and the help of Parks employees Vincent Verweij and Kevin Stalica in identifying some of the trees and in finalizing locations. Thanks to Trees Virginia for the funding. This entry was posted in Community Service, Education and tagged Arlington, notable trees, species, tree ID, tree identification, Tree Species. Bookmark the permalink. Great labels. Where did you purchase them? They would work great in our demonstration garden.